Hasphat Antabolis is an Imperial drillmaster and an Apprentice for the Fighters Guild. Hasphat Antabolis can be found in the lower level of the Fighters Guild in Balmora. He is also the author of Dwemer History and Culture which appears in Oblivion (and again in Skyrim) and Life and Times of the Nerevarine which has not yet appeared in any games. He offers minor training in Athletics, Block, and Hand-to-hand. Scarab Plans in Mzuleft: Retrieve Dwemer plans from the ruins of Mzuleft. "I am %Name, Drillmaster for the Balmora Fighters Guild. I offer training to the public, and, at a considerable discount, to members of the Fighters Guild." "What do you want? I'm a Drillmaster, if it's training you're looking for." "Good day, %PCName. So you're with Caius, eh? And Caius wants information? Of course, there's a this-for-that involved. I require a favor first, and then I'll tell you what you want to know." "Good day, %PCName. I am %Name, Drillmaster for the Balmora Fighters Guild. So you're with Caius, eh? And Caius wants some information? I'd be happy to help... though I will require a favor first. Then I'll tell you what you want to know." "So. Caius sent you? If you want something from me, I require a favor first, or forget it." "So. Have you done that little favor I asked?" "Hello again, %PCName. What do you want? You already gave me the Dwemer puzzle box. Don't you remember?" "Hello, %PCName. Was there something further you wanted to ask about?" Arkngthand: "The old Dwemer ruins at Arkngthand are extensive on the surface and underground. Head south out of town past the silt strider port, then cross bridges east over the Odai River. At the signpost, head north towards Caldera. Immediately on the right see a signpost for Molag Mar. Turn right and head uphill on an old road to cross an ancient Dwemer bridge over Foyada Mamaea. The entrance to Arkngthand is on the east side of the foyada, south of the bridge. Turn a crank on a pipe nearby to open the doors." current events: "The Great Houses hate each other -- theft, murder, assassination, secret raids, standard stuff. The Temple is trying to kill off a rebellious faction called the Dissident priests. Ashlander nomads raid each other, attack traders and pilgrims. A secret cult is killing off Imperial citizens. All bad enough. The real problem, though, is the Blight. Monsters and diseases. The natives say it comes from Red Mountain. It's been a local problem for years, but lately it's gotten badly out of control." "Dagoth Ur was the leader of the extinct Sixth House, House Dagoth, the traitor house destroyed in the War of the First Council. Dagoth Ur is the evil immortal enemy of the Tribunal Temple cult. The Temple blames Dagoth Ur and his hosts for all the evils that beset the Dunmer and Morrowind. Dagoth Ur dwells in fiery caverns beneath Red Mountain, served by his kin and legions of monsters." "So, %PCName. Dagoth Ur and all his kin are dead. You know. You slew them with your own hand, and the Blight is gone from Morrowind. And it would be very nice if they were to stay dead, forever, this time around. But I am a historian, and so I am a pessimist. I hope we will not grow too complacent." "I cannot read the Dwemer language, nor do I know anyone alive who can. Dwemer scholars have long been looking for a translation key. It is said that some of the oldest Telvanni have somehow learned the Dwemer language, but these may only be rumors." "With the "Hanging Gardens" book as a key, I can make out some of what "Divine Metaphysics" is saying. It seems to suggest that new gods may be created through some kind of sorcery. I do not know much of magic. Perhaps you should speak with someone who is both a wizard and a scholar." "That is very interesting. I am glad you found a way to translate this book, but what does it mean? Someday you should take these books to Cyrodiil and speak with the scholars there." Disappearance of the Dwarves: "The disappearance of the Dwarves predates Imperial written records; Dunmer oral accounts record that the Dwemer were utterly destroyed by the gods for profane practices and impiety. Dwarven ruins are scattered across Tamriel, and weapons, armor, housewares, coins, and other items of Dwemer design are often found, but the circumstances surrounding the disappearance of the Dwarves remains one of Tamriel's greatest mysteries." 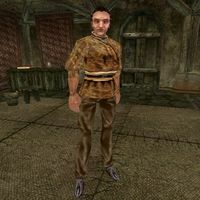 "Indeed, without false modesty, I can say I'm an expert on the Dwemer. But I'm not generous with my knowledge, and I won't share what I know until we are better acquainted, and closer associates." Dwemer artifacts: "Weapons, armor, housewares, coins, and other items of Dwemer design are often found in Dwemer ruins. They are prized by historians and antiquarians, and very valuable. The Emperor, however, has declared all newly discovered Dwemer artifacts to be possessions of the Crown, and forbids their trade or sale. Now smuggling Dwemer artifacts is treason, but smugglers will still risk execution for such a profitable crime." [Disposition < 70.] "[If he were better disposed toward you, he would have more to say on this topic.]" [Disposition ≥ 70.] "The Dwemer language is largely untranslatable, though the alphabet is known, and short inscriptions can be deciphered, usually from context clues. Fortunately, many Dwemer documents were written in Aldmeris, which is very close to modern Elven languages." "The little cube I'm looking for is about the size of a fist, maybe a little bigger. It will be made of a coppery metal, with a circular design and symbols on one side and some lined marks on the other sides. That's all I want, that little cube." "Yes. The inscriptions on the box seem to be the directions for setting a Dwemer key to open a specific lock. If you're interested, after you've delivered your report to Caius, come back, and maybe I'll have a key you can take back to Arkngthand." Dwemer sites: "There are many Dwemer sites on Vvardenfell, but the two largest are Mzuleft and Nchuleftingth. Mzuleft is in the Sheogorad region, is cursed and dangerous, and access is forbidden. Nchuleftingth is occupied by an expedition of the Imperial Archaeological Commission, and is not open to visitors." "I encourage you visit Senilias Cadiusus. Make sure you bring the letter of introduction I gave you." "Yes, I heard that Anes Vendu was dead. Is the expedition going well otherwise? Did they find the Dwemer translation key?" "I cannot read and write Dwemer myself, but this is a truly interesting find." "This "Egg of Time" is certainly very suggestive. I fear I am not quite able to piece together what is going on. You might want to take these books to another Dwemer scholar, perhaps one of the older Telvanni." "This is certainly an interesting book. I know many things about the Dwemer ruins here in Vvardenfell, but I'm afraid I can't confirm what this book says. Perhaps this is what destroyed the Dwarves, and perhaps not. The author certainly didn't seem to think so." "There are Dwemer ruins nearby called Arkngthand. I need you to run over there and find me a little cube with a circular design and some symbols on one side. It's called 'a Dwemer puzzle box'. Bring me back the Dwemer puzzle box, and I'll tell you what you want to know." "Right. As I said, get me the Dwemer puzzle box from Arkngthand, and I'll tell you what you want to know." "Perfect. Just what I was looking for. Just let me take this Dwemer puzzle box, and then I'll tell you what Caius will want to know about the Sixth House. And about the Nerevarine. By the way, the inscriptions on the box seem to be the directions for setting a Dwemer key to open a specific lock. If you're interested, after you've delivered your report to Caius, come back, and maybe I'll have a key you can take back to Arkngthand." "Yes. The box was just what I was looking for." Fighters Guild: "Services are cheap, and get cheaper as you advance in rank. But since Sjoring Hard-Heart, the new Guildmaster, deposed my old friend, Percius Mercius, things have gone a bit sour. My advice is to watch yourself with Hard-Heart and his cronies. They got more ambition than sense. Go see Percius Mercius in Ald'ruhn. And listen to what he tells you." Hanging Gardens: "Did you tell Senilias Cadiusus of this? This may be the translation key they have been searching for. If you find any other Dwemer books, perhaps I could try and translate them with this key." House Dagoth: "House Dagoth was the Sixth of the Seven Dunmer Great Houses. Nothing remains of the Sixth House. Its members were all slain or adopted into other Great Houses following their treason in the War of the First Council. Their clanstead was called Kogoruhn." "Caius says he's fed up with heroes. The Empire keeps sending them out here to the provinces to 'civilize' things. The fools don't seem to realize that their 'destinies' are being created by historical processes. And they're too ignorant and impatient to understand it. So Caius sends you to me, hoping you'll be different. Poor Caius. So many disappointments. So maybe you'll read 'On Morrowind, the Imperial Province'? And learn something about current events? That's what I recommend." "Caius and I always argue over the role of the individual in history. Is the individual shaped and controlled by history? Or can an exceptional individual shape history? Are individuals carried in the stream? Or do they dam and divert the flow? I say Tiber Septim changed the world. Caius says that Tiber Septim was a product of his time, and if he hadn't lived, some other person would have served his function. What about you? Are you going to change the world? Or just be carried by the flow?" "You have a favor to do first. Then we can talk about the Nerevarine." "The Ashlanders believe a reborn Nerevar will unite the Dunmer against the outlander invaders and restore the ancient Dark Elven nation. Nerevar is a legendary hero and saint of the Temple, but the Temple denies the prophecy, and persecutes heretics who believe in the Nerevarine. Tell Caius that Sharn gra-Muzgob would be a better person to ask about the native faiths and superstitions." "Now you are a part of history, %PCName. It is an honor to know you. And yet, there is still the mystery. Does the hero shape the times, or do the times shape the hero? Perhaps you should write a history book, %PCName." [Disposition ≥ 70. Letter to Senilias Cadiusus has been added to your inventory.] "My friend, Senilias Cadiusus, is the head of the Nchuleftingth expedition, and he is accompanied by his charming daughter, Pania Cadiusus. The Dwemer language has never been translated, and they are searching Nchuleftingth for a book that may be a Dwemer translation key. Here. Let me give you a letter of introduction. They might be willing to hire you." "You have a favor to do first. Then we can talk about the Sixth House." "I gave you the notes. Give them to Caius." Sixth House cult: "I've heard something about a secret cult worshipping Dagoth Ur. The idea is that the Tribunal are false gods who have betrayed Morrowind to the Imperials. The cult plans to overthrow the Temple and drive the Empire from Morrowind. The cult is outlawed by the Temple, the Great Houses, or [sic] the Empire, and I doubt it's very popular. I've also heard there's some connection with smuggling... that they smuggle goods, or hire smugglers, or something like that." Sixth House references: "Here's a list of cheap books; all of them will tell you something about the Sixth House and how it ended: 'The War Of The First Council,' 'Saint Nerevar,' 'Nerevar Moon-And-Star,' and 'The Real Nerevar.' Try the bookseller Dorisa Darvel over in the Commercial District. She'll have at least some of these titles." This page was last modified on 25 August 2016, at 19:33.